For years, I have written newspaper columns arguing that we all need to do a better job of educating young athletes about concussions. That includes doctors, athletic trainers, coaches, and parents. But I think the media who show and report on sports have a role to play as well. When I heard about the Concussion Legacy Foundation Media Project, I thought this effort was a great step to not only educate journalists about brain injuries in sports, but also the young athletes who play sports. I wrote about the program in my latest newspaper column. A worrisome trend in how concussions are shown on TV? Ever since I became an orthopedic surgeon and started working with athletes and teams in sports medicine, I have watched football differently. I still love the sport, but I can’t help studying the injuries closely. Over the last few years, I have noticed what, at least to me, is a worrying trend in how injuries are shown on TV. In the past, when a player lay hurt on the field, TV cameras would show the medical staff evaluating and treating the player on the field for 30 or 60 seconds. The analysts would talk about the injury, show a replay of the hit, and discuss the nature of the injury. Today the networks seem to go straight to a commercial without the commentators mentioning the injury at all. Or they make a cursory statement, such as “[insert player name] is down. Let’s take a quick break.” When coverage resumes, if there is a sideline report of the injury at all, it’s usually vague. This trend applies to all injuries, but I have noticed it most often with concussions. The skeptic in me wonders whether injuries are the reason for the immediate commercial. Maybe the networks are simply trying to make more advertising money. But it could also be a deliberate attempt to avoid showing viewers how dangerous football can be. Or it could be a result of the networks and their hosts and reporters not knowing enough about brain injuries to comment in an educated way. Do athletes understand the significance of concussions and CTE? In a Sports Illustrated roundtable discussion with six NFL writers, many of the journalists noted how NFL players don’t seem to be well-versed on concussions and CTE. You know who else doesn’t understand enough about these injuries? Young kids who play football. 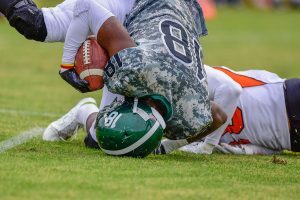 While education about traumatic brain injuries in sports has certainly improved in recent years, the CDC has shown that children from lower income families do not receive adequate concussion education. And coaches generally don’t have the medical training to evaluate and treat these injuries themselves, let alone teach children and parents what to look for. Television, right or wrong, plays a large role in how kids think and behave. Since the majority of the most watched TV broadcasts each year are sporting events, sports media can have a large influence on how a young athlete views and treats a sports injury should he or she suffer one. In November, the Concussion Legacy Foundation launched the Concussion Legacy Foundation Media Project, aiming to better educate the public about brain injuries in sports. The Media Project has two tracks to change how brain injuries are covered by journalists. The first involves a concussion reporting workshop for students at university journalism programs. The curriculum was developed by the CLF with prominent journalists and media professionals: J.A. Adande, Director of Sports Journalism at Northwestern University, Olivia Stonksi, Director of the Sports Media Center at Syracuse University, and Andrea Kremer at Boston University. The Concussion Legacy Foundation Media Project educates broadcasters on key areas of these injuries. Use “concussion” or “brain injury” instead of “ding” or “bell rung.” Take concussion signs seriously, and don’t make fun of athletes demonstrating worrisome behavior, like walking into the wrong huddle. Don’t glorify an athlete playing through this injury as tough. Know the league’s concussion protocol and discuss when it wasn’t followed. Chris Nowinski, Ph.D., CEO of the Concussion Legacy Foundation, points out that many children first learn about concussions through watching sports. If kids watch journalists discuss brain injuries in an honest and informed way and explain accurately how they should be handled when they occur, they will more likely respond appropriately if they suffer these injuries themselves. After all, brain injuries in sports are serious. If the journalists covering them take them seriously, the young athletes and their families might too. Note: A modified version of this article appears as my sports medicine column in the January 31, 2019 issue of The Post and Courier. Concussion Legacy Foundation launches CLF Media Project to train journalists, students how to best report on concussions. November 8, 2018. Roundtable: NFL reporters on concussions, under-covered stories and more. By Richard Deitsch. Sports Illustrated. January 15, 2017.